Welcome to our 3-day hop showcasing, you guessed it, bears! Well, Teddy Bears to be precise. Teddy Bears from Cricut's Teddy Bear Parade! You can pick him up at either end. And he's always there when you need him most." We hope you will be inspired by our teddy bear creations. As you hop along from blog to blog, you may see some blog candy being offered. Please follow the blogger's instructions to enter and be eligible to win. If you just happened on my blog, please start at the beginning of our hop with Janis of Pause Dream Enjoy (http://pausedreamenjoy.blogspot.com/). 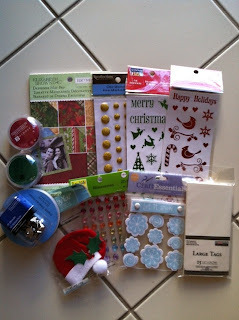 If you came here from Laura W.~ http://scrappinsweetiesescape.blogspot.com , you're in the right place! I just fell in love with this cute little baby teddy bear. The bottle and pacifier are so adorable. 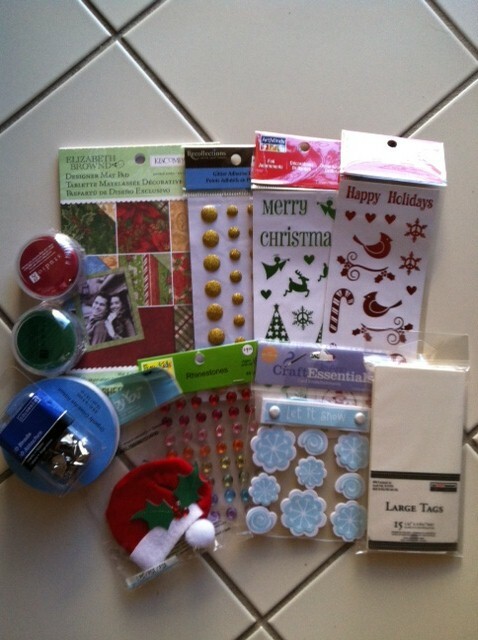 I used a step up card with papers from Paper Studio Sweat Pea Collection. The papers are softer pastel color, which is perfect when making a baby themed card. Here's a close up of the card. I did use Glossy Accents on her eyes and nose, to make them look more real. I love the look of My Craft Spot vanilla crinkle ribbon that I used at the top of the card. The rhinestone in the middle is from Recollections. Here's my blog candy for this hop. 1. You must be a follower of my blog. 2. Leave a comment on this post. This is open to US and Canadian residents only due to shipping cost. Thanks for stopping by! Don't forget to stop by tomorrow for another day of teddy bear creations! Here's a list of the next two days. Please remember some of us in the hop may be in the path of the hurricane and without power during this hop. If you don't see a card please move on to the next person on this list. This card is so cute. It would make a cute baby card for boy or girl by just changing the colors. This cartridge looks adorable. Very cute!! I love the colors that you used on this card. It is perfect!! such a cutie. The pacifier is so adorable and the ribbon with the rhinestone is beautiful. Eeek! This just screams adorable! Love it! Too stinking cute. The more I see the more I want this cartridge. Love it!!! What a adorable card. As many times as I've looked at and used this cartridge I have not noticed the baby bear. Great card - I love it. Tara this is so cute! I love the papers that you chose! What a cute baby bear! I love the soft feel of your card and that ribbon is super! You card is so very cute!! Made me smile! Thx for blog candy and for sharing your talents. I love purple. I just want to hug this little one. I can not get over how precious this card is! I love that its not a typical card either, I think that adds so much. Really loving the ideas with this cartridge! WILL HAVE TO PUT ON MY WISH LIST! 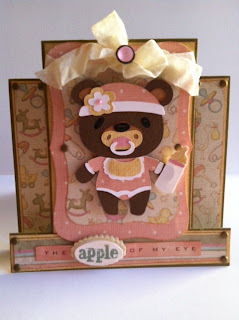 Tara, your cards are always so impresive:) I love how you did the step up card and your little baby bear is so cute !! Super sweet baby bear. I love your design. Who wouldn''t love a bay bear...especially in the cutest pink there ever was! TSMFS! I am now a flollower!!! oh my goodness1 the Baby Bear is so so cute! Tara, this is awesome! I have never made a center step card....this turned out so cute! I love the colors and patterns...and her little pacifier! Just makes me smile! What a darling card! !Very Sweet! This is so cute! I love the baby bear! I wasn't sure I needed this cartridge before, but now I think I might just have to have it! This is really a cute card. I love it. I am a new follower and also going to add your button to my blog. Love your blog. Thanks for the chance to win. OMGosh, she is just too cute and I love that paper and bow! Your baby bear is so cute. Have the perfect person for this one. I'm gonna have to get this cart. Have a great granddaughter being born the end of this month. Thanks for showing us. I'm now a follower of your blog. Oh how very cute! Just adorable! O MY GOODNESSS CUTE CUTE CUTE!! Thanks for the chance at some goodies too..
love those bears. thanks for a chance to win. Oh my gosh, this is so adorable!! I love the sweet teddy bear and her pacifier!! The design is fabulous!! What an awesome card, Tara!! I love it!! So sweet. Reminds me of the card my mom got from my brother for Easter last year...also a baby with a pacifier! Thanks for sharing. 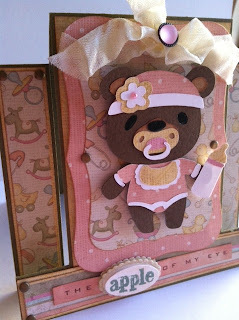 Too cute, I just love this card fold! And the bears are just so cute. I love this card. I really like the center step card. This was perfect. Am already a follower. What an adorable baby bear with the cute pacifier. Like the card fold you used. This card is so cute. That baby bear is adorable. I'm a new follower. Aww, your card is too cute! I love this little baby bear too, how cute is she or he?!! A great job on the card. Love all the different teddy bears with this cartridge. Wonderful project! TFS! I am already a faithful follower! just love your teddy bear and your blog. Beautiful embellishments for your baby girl bear. Currently following. Love the baby bear. So precious. I became a follower. Darling baby card. I like the pink and brown combo. The background nursery paper is cute. Adorable baby bear. I'm going to have to take a second look at this cartridge. Soooooo cute! I just gotta get this cartridge:) These bears all over blog land are just adorable! TFS! Love the "bewitching blog"! Also love this bear! This is so much fun seeing how everyone did something different. This is adorable! The layout is wonderful and that bear is gorgeous! TFS! Love that baby bear and her binky and bottle! She's prepared! SSSoooooo stinkin' cute, Tara!! LOVE your card! You rocked it, girl! Pause Dream Enjoy Challenge: Anything Goes! !